Be the first to share your favorite memory, photo or story of Holly. This memorial page is dedicated for family, friends and future generations to celebrate the life of their loved one. Holly Elizabeth Brill, loving daughter, mother, grandmother, sister, and friend, passed away unexpectedly on Friday March, 22, 2019, at age 41. Holly grew up in Bowling Green, Ohio. She was a resident and long-time community activist, supporting many families in the greater Toledo area. Holly was born on February 23rd, 1978 and attended the Bowling Green schools. Holly welcomed her beautiful daughter, Marissah in 1995, who later bore Holly’s two grandchildren. These three were the light, joy, and loves of Holly’s life. On any given day, Holly could be found spending quality time with her grandchildren helping them learn and grow, playing with them at the park, taking them for ice cream treats, or telling them silly jokes and capturing joyful moments. Aside from the daily care-taking of her family and grandchildren, Holly was a fiercely loyal friend, passionate about the legal and justice system, and fighting for equal and fair treatment of all. Holly was an advocate and volunteer. Holly understood people, she united and related to persons from all walks of life. She blessed us with unique gifts to bridge wide divides with warmth, wit, and laughter. Holly was quick to remind us we all “Bleed the Same,” and this was one of her greatest gifts. 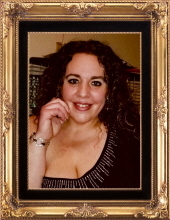 Holly was always giving whatever she had to help others in their darkest times of need; whether it was a ride, phone call & a shoulder to cry on, a good laugh like no other, or offering her time to help resolve unresolved cases for families. She often took the lead to speak for families in need, and galvanized community support on their behalf. Holly had dreams and was pursuing volunteer work related to developing her skills. Holly was an extraordinary blessing to so many, she will be missed tremendously. Please honor and celebrate her, by treating people with her beautiful essence and kindness in mind. To send flowers or a remembrance gift to the family of Holly Elizabeth Brill, please visit our Tribute Store. "Email Address" would like to share the life celebration of Holly Elizabeth Brill. Click on the "link" to go to share a favorite memory or leave a condolence message for the family.